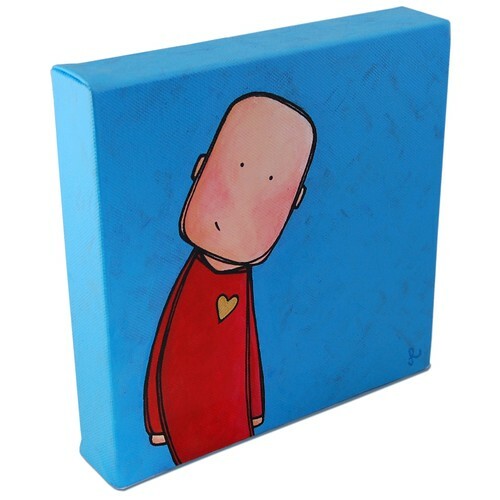 Lovestruck – acrylic on box canvas approx 20cm x 20cm. 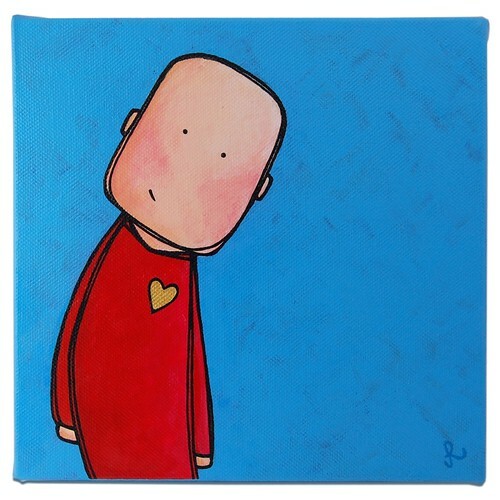 A squarehead person with a gold heart motif on their red shirt. I experimented with capturing the process of painting this using video and stills. There was a lot of footage! I condensed it into a three and a half minute video which shows the process and progress of the piece. This video gives a taste of how one of my small canvas comes together. I learnt quite a bit by scrutinising the process and seeing my mistakes on video! But I think it turned out pretty good in the end. I hope the recipient agrees as this is being given as a gift. Love this! and you know how to edit video — I’m envious:-) I especially like the background w the 2 blues. And its SOLD!!!! Do you do illustrating? your work is AWESOME!!! I love it. What do you charge? I’d love something like this for my nieces. Really nice piece of artwork – had the background been black or cream it would have looked lovely in my lounge! lovely to watch and so interesting to see your process!